Oil & Gas | GReD - Geomatics Research & Development s.r.l. The use of gravity data to retrieve information related to the subsurface is a quite classical technique in geophysical exploration and it is still nowadays an important source of information. In fact it allows retrieving knowledge on the geophysical characteristics of large areas and at unreachable depth respect to other techniques. Consequently, gravity inversion represents an optimal tool in the initial phase of an exploration project since it can be used to optimize the design of more expensive activities, such as seismic acquisitions. GReD provides custom development of innovative methodologies and advanced software for the acquisition, processing, and inversion of gravity and magnetic data for geophysical exploration. We also provide services including gravity and magnetic data processing, analysis and interpretation. 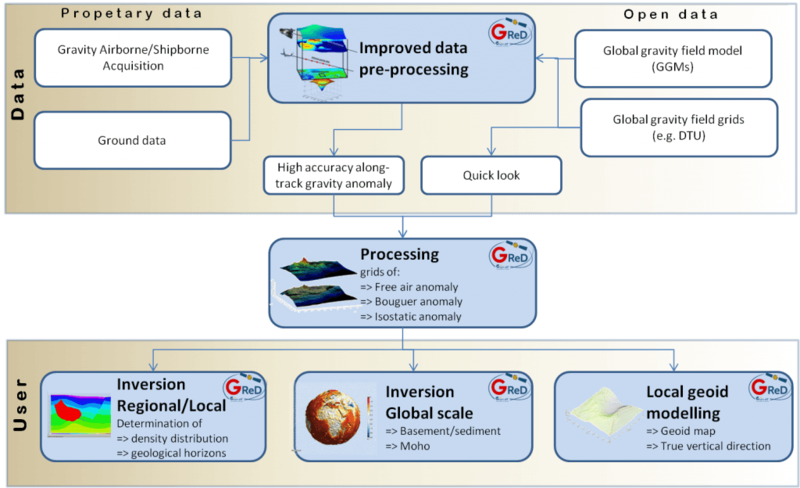 Gred has developed innovative methodologies and advanced techniques for the acquisition and processing of gravity data. GReD solutions will allow to obtain higher accuracy airborne gravity observations, by combining the potential of multi-constellations satellite navigation systems with the gravity data coming from the most recent dedicated satellite missions. GReD is developing innovative solutions aimed to combine qualitative geological information with quantitative gravity data in a Bayesian framework. The results is a 3D model of the structure of the Earth’s crust, preserving the original intrinsic characteristics, i.e. with sharp boundaries between different layers and structures, with realistic densities variations, and fitting the gravitational observations..
GReD has developed a service to exploit gravity observations, integrated with others in situ data, e.g. derived from seismic profiles, to study and build 3D models of the Earth crust at regional scale. The service results will primarily help oil & gas companies in the identification and selection of the most promising acreage, from a petroleum point of view, in the early stage of the exploration activities. 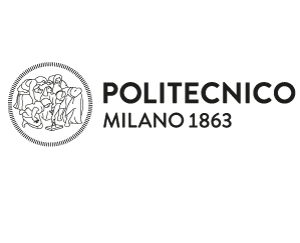 In 2012 the GEMMA project funded by Politecni-co di Milano and the European Space Agency, through the Support To Science Element pro-gramme (Contract No. 4000102372/10/I-AM) demonstrated the possibility to exploit GOCE gravity data to model the main features of the crust both globally and regionally. The use of satellite data for this activity in fact, offers the main advantage of giving a regional outline of the crustal architecture that cannot be obtained by local seismic profiles or gravity ob-servations. This dataset can be profitably used in the so called “Assets e Prospects” operation which takes place before the upstream activities. In 2015 ESA, through the Value Adding Element (VAE) program, funded a new project (Contract No. 4000117591/16/I-NB), called GIULIA (Gravity Inversion to Understand LIthosfheric Architecture), in order to understand the possibility to ex-ploit GOCE satellite data for oil & gas ex-plorations activities. Basically the project consists in analyzing the characteristics of freely available data-set and conducting an example of crustal structure estimation on a test area (the Le-vant has been chosen as test area). The Levant test case, studied within the GIULIA project, shows how gravity models based on the ESA satellite mission GOCE can be proficiently used to obtain infor-mation useful for oil & gas exploration pur-poses. GOCE data can help in defining homogene-ous (from the density point of view) geologi-cal regions and in giving information on the nature of the studied crust. Moreover the inversion of the gravitational field, properly complemented by external information such as density models, seismic profiles, etc. allows to estimate the Moho and the basement depth. The results allow to build a 3D density model of the region correlated by maps defining the estimated accuracy of each discontinuity. • Refined 3D density model of the region. In particular a scale factor for the density function of each geological model has been estimated.